Provide comfort for the family of Joseph Ross with a meaningful gesture of sympathy. Joseph Louis Ross quietly and softly accepted the call of God and departed this earthly life on Sunday afternoon, February 24, 2019 at the Jersey Shore University Medical Center in Neptune, New Jersey. Born in Blackstone, Virginia on February 23, 1937, he was the youngest of four siblings born to the late Oscar and Betty Ross. After a fire in Virginia the family relocated to 135th Street between Lenox and Seventh Avenues in Harlem, New York when he was four years old. Joseph L. Ross was reared in a Christian home and began his life of serving God with his family at Jerusalem Baptist Church in Blackstone, Virginia. 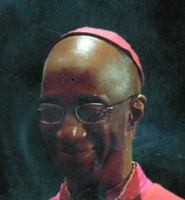 Joseph (Known as Apostle Ross) attended the public schools of New York City and with a “Satisfactory Record in Scholarship, Behavior and Citizenship Merited Graduation” from Bronx Vocational High Scholl, Bronx, New York in June 1955. “By virtue of his athletic ability, fine moral character and true sportsmanship,” was awarded the school letter in Tennis, Track and Basketball. He had the opportunity to play basketball against Cal Ramsey and Connie Hawkins during that time. Apostle Ross was employed for twenty-five years at Zayres in New York City and also played basketball with the company team. Apostle Ross devoted his life of service to God, his family the community and Prayer Temple Church family. His focus was always on spiritual growth, surrounding community at large and maturity of those under his leadership. He leaves a legacy of compassion, love, peace and Forty-Five-Years proclamation of God’s Word. He was a most humble servant of God, sacrificing until the end. In addition to his parents and wife, Joe Ross was preceded in death by one brother, Mr. Calvin E. Ross, two sisters: Mrs. Lorraine V. Fitzgerald and Mrs. Alfreda Sykes; aunts, uncles, other relatives and dear friends. Joe L. Ross leaves to remember and honor his life: a devoted son, Bishop Darren J. Ross; a daughter-in-law, Elder Lisa Ross; one grandson, Master Levi Ross; two aunts, Mrs. Atles Ruth, of Brooklyn, New York and Mrs. Mazie Wilson of Ehrhardt, South Carolina; eight nieces, Mrs Loretta (Howard) Ratcliff of Bronx, New York, Mrs. Claudia (Oscar) Johnson of Mt. Vernon, New York, Mrs. Marcella (Carl) Richardson , of Queens, New York, Ms. Margie Worlds, of Chesapeake, Virginia, Ms. Pamela Singleton, of Ehrhardt, South Carolina, Evangelist Norma (Clifton) Jordan, of Bamberg, South Carolina, Reverend Yvonne Singleton, of Bamberg, South Carolina, Mrs Kimberly (James) Slater, of Clifton, Virginia; nine nephews; Mr. Novell (Lazelle) Fitzgerald, of Brooklyn, New York, Mr. Walter Sykes and Mr. Skip Syukes, of Chesapeake, Virginia, Mr. Robert Ross, of Bronx, New York, Reverend Danny (Betty) Singleton, Ehrhardt, South Carolina, Reverend Joe (Evelyn) Singleton, of Orangeburg, South Carolina, Dr. Monnie (Erma) Singleton, of Bamberg, South Carolina, Reverend G. Curtis Singleton, of Macon, Georgia and Mr. Arnold (Sephanie) Singleton, of Summerville, South Carolina; God given sister; Mother Ruth Roseboro, of Bronx, New York; seven great nieces; six great nephews; seven great-great nieces; six great-great nephews; two great great-great nephews; ten godchildren, Elder Deborah Ocasio, Peter Harris Lydia Green, Jaman B. Thomas, Angelina Bradley, Lance Smallwood, Tatiana Green, Jacqueline Green, Dominique Green and Jaylene Currie; a host of other relatives, cousins, friends and the Prayer Temple Church Family. To send flowers in memory of Joseph Louis Ross, please visit our Heartfelt Sympathies Store. Provide comfort for the family of Joseph Louis Ross by sending flowers.